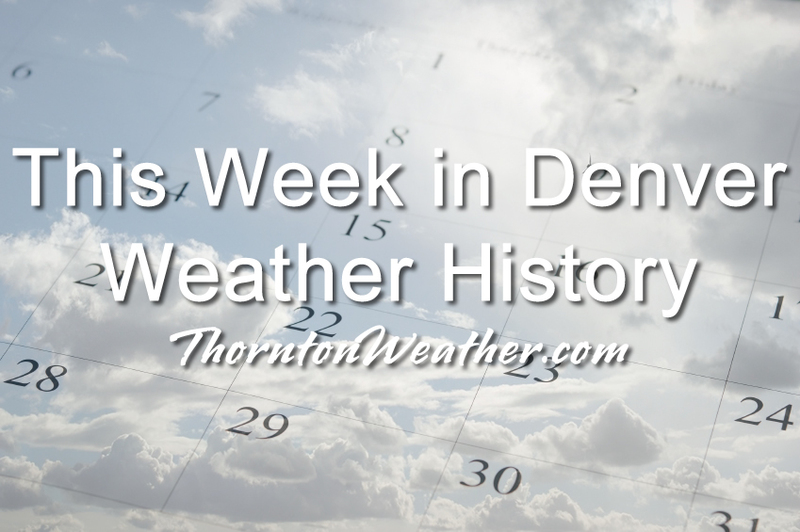 April can be a very eventful weather month and we see that in our look back at this week in Denver weather history. Particularly notable are many major snow events including two in recent history – one in 2001 and another in 2005. In 1973…a major spring snow storm dumped 11.6 inches of snowfall over metro Denver. North wind gusts of 30 to 35 mph produced some blowing snow. Most of the heavy wet snow… 10.1 inches…fell on the 7th when temperatures remained in the 20’s. Snow accumulated on the ground to a maximum depth of 9 inches. Low temperature of 5 degrees on the 8th was a new record minimum for the date and the lowest for so late in the season. In 1913…heavy snowfall totaled 10.9 inches in downtown Denver behind a cold front. Most of the snow fell on the 8th. Northeast winds were sustained to 35 mph with gusts to 38 mph on the 9th. In 1935…moderate dust blew into the city around 9:00 pm on the 7th and persisted until early afternoon on the 9th. Southeast winds were sustained to around 20 mph on the 7th and 8th. Winds shifting to the west at sustained speeds to 20 mph cleared the dust from the air on the 9th. In 1959…snow falling over a 5-day period totaled 20 to 30 inches just east of the mountains…while over the plains blizzard conditions closed schools and blocked highways. The second big storm in two weeks dumped 16.4 inches of snowfall on Stapleton Airport with the most…11.6 inches… Occurring on the 8th. East winds gusted to 37 mph on the 9th. Temperatures dipped into the single digits on the mornings of the 7th and 12th when 7 degrees were registered. Low temperature records for the dates were set on the 9th…10th…and 12th. The cold temperatures caused streets to glaze with ice…resulting in the death of a pedestrian who was struck by a car in Denver. Three people died from heart attacks while shoveling the heavy… Wet snow. In 1885…dense smoke polluted the air until noon. In 1887…south winds were sustained to 42 mph. In 1890…northwest winds were sustained to 48 mph with gusts as high as 60 mph. In 2005…a mixture of strong pressure gradient winds coupled with thunderstorm outflow winds produced high winds across metro Denver. The high winds downed power lines and knocked out electricity to about 19 thousand customers on the east side of metro Denver. High wind reports included gusts to 68 mph in Longmont…61 mph near Castle Rock…59 mph at Centennial Airport…and 54 mph at Denver International Airport. In 2013…heavy snow developed in and near the Front Range Foothills and Palmer Divide as an upper level trough made its way across southern Colorado. Snowfall was enhanced locally with the presence of an upper level jet. Storm totals included: 23 inches near Eldorado Springs…18 inches just west of Boulder…16.5 inches near Orodell…15 inches…4 miles west-northwest of Boulder; 13 inches at Gold Hill; 12 inches at the National Weather Service Office in Boulder…11 inches in Ken Caryl; 8.5 inches near Morrison; 8 inches at Genesee and Roxborough Park; 7.5 inches near Arapahoe Park; with 6.5 inches at Denver International Airport. In 1999…a windstorm caused 20 million dollars in damage along the Front Range urban corridor from Fort Collins south to pueblo and to the east over the plains…making the storm equal to the costliest windstorm ever…which occurred in Boulder on January 17…1982. In metro Denver… Several homes were damaged as shingles were blown off roofs. Large pieces of a roof torn off a strip mall in Lakewood damaged several cars in a parking lot. Most of the damage to homes consisted of broken fences…awnings…doors…and windows. Scores of automobiles suffered broken or cracked windshields and paint damage from flying debris. Multiple accidents were triggered as several tractor-trailer rigs were blown on their sides by the strong cross-winds. Blowing dust and dirt caused near zero visibilities at times. Both I-25 and I-76 were closed north and northeast of Denver. State Highway 93 was closed between Golden and Boulder. Several trees…power poles…and power lines were downed…causing a number of outages as well as sparking a few small grass fires. Highest wind gusts reached 112 mph atop Niwot Ridge near the continental divide west of Boulder…102 mph at Wondervu…100 mph at the National Center for Atmospheric Research mesa lab in Boulder…98 mph at the national wind technology center near Broomfield…96 mph on Rocky Flats…92 mph at Jefferson County Airport near Broomfield and on the University of Colorado campus in Boulder…and 90 mph at Highlands Ranch in southwest metro Denver. Winds gusted to 48 mph at Denver International Airport. In 1950…strong southwest winds gusting to 58 mph reduced the visibility to 1 mile in blowing dust at Stapleton Airport. Scattered minor wind damage…consisting of falling tree branches and damage to signs…occurred across metro Denver. In 1989…6 to 12 inches of snow fell at many locations in the Front Range foothills. Boulder received 6 to 8 inches. Five inches (5.0 inches) of snow fell at Stapleton International Airport…causing 2 hour flight delays. I-25 south of Denver was closed for 4 hours due to a 100- car traffic pileup. North winds gusted to 33 mph at Stapleton International Airport where the maximum snow depth on the ground was only 3 inches due to melting. In 1900…rain changed to heavy snow and totaled 6.8 inches in downtown Denver overnight. A thunderstorm occurred on the 9th. North winds were sustained to 32 mph with gusts to 38 mph on the 10th. Precipitation totaled 1.39 inches. In 1933…post-frontal heavy snowfall totaled 9.4 inches in downtown Denver. East winds were sustained to 21 mph with gusts to 22 mph on the 9th. In 1944…7.0 inches of snow fell on downtown Denver. Northeast winds were sustained to 24 mph on the 9th. In 1977…the two warmest days of the month resulted in two temperature records being set. High temperature of 81 degrees on the 9th set a new record maximum for the date. High temperature of 80 degrees on the 10th equaled the record maximum for the date. The unusually warm weather for so early in April produced a late afternoon thunderstorm on the 10th. In 1993…strong downslope winds occurred along the Front Range. While the strongest winds were in the foothills north of Denver…wind gusts to 69 mph were recorded at Jefferson County Airport in Broomfield. Northwest winds gusted to 39 mph at Stapleton International Airport. In 2004…a spring storm brought heavy snow to metro Denver. The heaviest snow fell in the foothills and over and near higher terrain. Snowfall totals included: 20 inches near Jamestown; 18 inches atop gold hill; 17 inches near Evergreen; 15 inches at Nederland and Eldora; 13 inches at Blackhawk; 11 inches at Aspen Springs; 9 inches in Louisville; 8 inches at Ken Caryl; 6 inches at Niwot… Near Sedalia…and in Thornton; 5 inches in Lakewood… Lyons…and Westminster. Snowfall was 4.4 inches at Denver Stapleton. Northwest winds gusted to 21 mph at Denver International Airport. In 2008…a very moist storm brought heavy snow to parts of the Front Range foothills. Storm totals included: 12.5 inches at Aspen Springs…11 inches…4 miles west- southwest of conifer; with 10.5 inches…3 miles north of central city and 6 miles southwest of Evergreen. Lesser amounts of 5 to 9 inches were observed elsewhere. North winds gusted to 43 mph at Denver International Airport on the 10th…and 1.8 inches of snow fell at the former Stapleton International Airport. In 1951…heavy snowfall totaled 9.4 inches at Stapleton Airport. The storm was accompanied by strong northeast winds gusting to 43 mph. In 1953…heavy snowfall occurred at Stapleton Airport where 7.9 inches of snow were measured. North winds gusted to 29 mph. In 1994…6 to 14 inches of heavy snow buried much of eastern Colorado…closing many schools and I-70 from east of Denver to the Kansas border. Rain changed to snow on the 9th…and snow continued through the 11th. Snowfall totaled 5.7 inches at Stapleton International Airport…but maximum snow depth on the ground was only 3 inches on the 10th due to melting. East winds gusted to 26 mph on the 9th. In 1995…a major spring storm dumped 8 to 16 inches of snow in the foothills west of Denver. Snowfall totaled 8.3 inches at the site of the former Stapleton International Airport…but most of the snow melted as it fell with the maximum snow depth on the ground of only 2 inches. Five-to 6-inch snow accumulations occurred over southern portions of metro Denver and eastward onto the plains. Northeast winds gusted to 36 mph at Denver International Airport on the 10th. I-70 was closed for several hours east of Watkins to the Kansas border due to drifting snow and near whiteout conditions. High temperature of only 29 degrees on the 10th was a record low maximum for the date. In 1901…rain changed to snow and totaled 10.8 inches in downtown Denver over the 4 days. Northeast winds were sustained to 28 mph with gusts to 31 mph on the 11th. Temperatures hovered in the 30’s. In 1896…southwest winds were sustained to 40 mph with gusts to 60 mph. The apparent Chinook winds warmed the temperature to a high of 76 degrees. In 1899…northwest Chinook winds were sustained to 45 mph with gusts as high as 60 mph. The downslope winds warmed the temperature to a high of 73 degrees in the city. In 1979…a heavy snow storm produced near-blizzard conditions across eastern Colorado with 10 to 20 inches in the foothills and 4 to 8 inches over the plains. Winds to 35 mph combined with the snow to produce drifts at least 3 feet deep…closing many roads and causing power outages. Travel was interrupted south of Denver when the storm closed both I-25 and State Highway 83. Snowfall totaled only 3.8 inches at Stapleton International Airport where northeast winds gusted 37 mph…causing some blowing snow on the 11th. In 2001…a potent spring storm dumped heavy snow over metro Denver and the adjacent foothills…while a blizzard roared across the plains to the east of Denver. Snowfall amounts ranged up to a foot and a half across metro Denver and in the foothills. North to northwest winds at sustained speeds of 40 to 50 mph with gusts as high as 60 mph piled the snow into drifts of 3 to 6 feet deep. I-25 southbound was closed at Lincoln Avenue. I-70 to the east was closed at gun club road. The combination of heavy wet snow and damaging winds resulted in widespread electrical outages. Denver International Airport was completely shut down for the first time in its brief 6-year history. Power surges and outages crippled the airport’s massive computer systems. The airport was closed at 5:00 am and did not re-open until mid-afternoon on the 11th. The power outages resulted in businesses and schools closing. Over all of northeastern Colorado…there were 220 thousand customers without power… The worst outage in Xcel Energy’s history. Repairs totaled 1.6 million dollars. Across metro Denver…snow totals included: 18 inches in southeast Aurora…16 inches at centennial airport and Parker…14 inches at Broomfield… 13 inches in Louisville…12 inches at Lakewood and Morrison… 11 inches at Ken Caryl and Thornton…10 inches at the site of the former Stapleton International Airport and in Wheat Ridge…9 inches in Westminster…and 8 inches in Littleton. Thunderstorms preceded the start of the snow on the afternoon of the 10th and were embedded in the snow storm during the early morning hours of the 11th at Denver International Airport where northwest winds gusted to 60 mph on the 11th. Snow storm totals in the foothills included: 17 inches at Genesee…16 inches at Rollinsville… 14 inches at Intercanyon…13 inches in Coal Creek Canyon and near Evergreen…11 inches at Aspen Springs and Chief Hosa…10 inches at Blackhawk…and 9 inches atop Crow Hill. In 2005…a strong spring storm produced blizzard conditions in areas to the east of Denver and south of I-76 and near- blizzard conditions across metro Denver. The combination of heavy snow and strong winds forced the closure of Denver International Airport…stranding thousands of travelers. Long stretches of I-25…I-70…and I-76 were also closed due to extensive blowing and drifting snow. Snow amounts ranged from 1 to 2.5 feet in and near the eastern foothills and over the Palmer Divide. Drifts were 2 to 5 feet in depth. Downed power lines caused scattered electrical outages. Storm total snowfall amounts in and near the foothills included: 31 inches near conifer; 27.5 inches in Aspen Springs; 25.5 inches near Sedalia and Blackhawk; 25 inches near Bergen Park and around Genesee; 24.5 inches at pine junction and Roxborough Park; 24 inches southwest of Boulder; 23.5 inches at Ken Caryl; 23 inches atop Crow Hill and near Larkspur…Evergreen…and Nederland; 21 inches at Eldora Ski Area; 18 inches at Eldorado Springs and near Castle Rock; 17 inches near Chatfield Reservoir and Perry Park; and 16 inches near Jamestown. Across the city storm total snow amounts were: 22.5 inches in Aurora; 22 inches at Bennett; 20 inches near Arapahoe park and in centennial… Littleton…and south Denver; 17.5 inches near Bennett; 16 inches in Thornton; 15 inches in Lakewood; 14.5 inches in wheat ridge and near Englewood; 14 inches at lone tree and in Arvada; and 9.9 inches at Denver Stapleton. North winds were sustained from 25 to 35 mph with gusts to 46 mph at Denver International Airport on the 10th. In 1997…a pacific storm produced heavy snow on the 10th and the 11th in and near the foothills with 6 to 8 inches at Louisville and turkey creek canyon…5 inches at Morrison… And only 3.5 inches at the site of the former Stapleton International Airport. Northeast winds gusted to 24 mph at Denver International Airport. The storm also brought unseasonably cold weather with 5 new temperature records equaled or broken. Record low temperatures of 8 and 6 occurred on the 11th and 12th. Record low maximum temperatures of 20…19…and 30 occurred on the 10th…11th… And 12th respectively. This was also only the second time on record that the temperature had failed to reach the freezing mark for 3 consecutive days in April. In 1927…post-frontal rain on the 10th changed to snow on the 11th and continued through the 14th. Snowfall totaled 8.5 inches from precipitation of 1.28 inches. North winds were sustained to 26 mph with gusts to 29 mph on the 13th. In 1954…strong and gusty southeast winds blew all day. Winds as high as 30 mph with gusts to 50 mph produced some blowing dust at Stapleton Airport. In 1966…a tornado was sighted in an open area of southeast Denver. Slight wind damage in the area was not directly attributable to the tornado. Later in the day…a pilot reported a funnel cloud 10 miles southwest of Denver. Hail to 1/2 inch in diameter fell at Stapleton International Airport. In 1984…strong Chinook winds gusted to 72 mph at Rocky Flats south of Boulder; speeds reached 70 mph in both Lakewood and Boulder. At Stapleton International Airport… Northwest wind gusts to 52 mph were recorded. In 2004…an afternoon cold front produced north winds sustained to 36 mph with gusts to 53 mph at Denver International Airport. Light snowfall was 1.1 inches at Denver Stapleton through the evening. In 1876…heavy snow began during the late afternoon of the 11th and continued through the night. Light snow ended around mid-morning of the 12th. The amount of snow was not measured…but precipitation totaled 0.70 inch…which would be around 7 inches of estimated snowfall. Strong winds accompanied the heavy snowfall. In 1896…post-frontal light rain changed to light snow overnight…but totaled only a trace. Northeast winds were sustained to 45 mph with gusts as high as 62 mph on the 12th. In 1991…a strong pacific storm dumped heavy snow across metro Denver with amounts of 6 to 15 inches at lower elevations and up to almost 2 feet in the foothills west of Denver. Snowfall reports included: 21 inches at Idaho Springs…19 inches at Aspen Springs…15 inches in Arvada… 14 inches at Rollinsville…10 inches in Boulder…8 inches in Aurora…and 7.3 inches at Stapleton International Airport where northeast winds gusted to 24 mph on the 11th. In 1906…north winds were sustained to 52 mph in the city. In 1916…post-frontal north winds were sustained to 40 mph with gusts to 42 mph. Light rain also occurred. In 1964…strong gusty winds raked metro Denver. Wind gusts estimated to 60 mph or higher caused widespread damage to buildings and power lines. Blowing dust closed some roads. A wind gust to 46 mph was recorded at Stapleton International Airport. In 1967…microburst winds gusted to 51 mph at Stapleton International Airport. In 1982…wind gusts to 60 mph were reported in and near the foothills. Wind gusts to 44 mph were recorded at Stapleton International Airport. In 1987…snow fell over metro Denver…causing traffic tie-ups on the roads and at Stapleton International Airport where some flights were delayed for 90 minutes. I-25 south of Denver was closed for a time due to numerous traffic accidents. While only 4.2 inches of snow fell in Denver… Foothills to the southwest received 6 to 12 inches of snow. North winds gusted to 33 mph at Stapleton International Airport where the maximum snow depth on the ground was only 2 inches due to melting. In 1922…post-frontal rain changed to heavy snow…which totaled 7.0 inches in downtown Denver. This was the second snow in 3 days. North winds were sustained to 29 mph with gusts to 31 mph on the 12th. In 1993…heavy snow occurred in the foothills northwest of Denver with 21 inches recorded at the Eldora Ski Area. Only 1.9 inches of snow fell at Stapleton International Airport where northeast winds gusted to 32 mph on the 13th. Most of the precipitation from the storm fell as rain across the city with 0.62 inch of precipitation measured at Stapleton International Airport. In 1933…heavy snowfall of 5.6 inches occurred in downtown Denver on the 12th and 13th behind a vigorous cold front… Which presented an awe-inspiring spectacle as it approached the station during the late afternoon of the 12th. Brilliant white wind-torn cumulus clouds were sandwiched by a brownish- tan dust cloud at the surface and dark blue cumulus clouds above. The dust cloud storm rapidly enveloped the station with northeast winds sustained to 38 mph and gusts to 44 mph producing much blowing dust…which was accompanied by rapidly falling temperatures and rising pressure. Moist snowfall started in about an hour and continued to midday on the 13th. Record low temperatures of 17 and 15 degrees occurred on the 13th and 14th respectively. The high temperature of only 27 degrees on the 13th was a record low maximum for the date. In 1927…snowfall totaled 8.5 inches in downtown Denver. Most of the snow fell on the 14th. Northwest winds were sustained to 27 mph during the storm. In 1873…heavy snow started with fresh and brisk north winds around 9:00 am…and continued heavy until 2:00 pm and lightly until 7:00 pm. Temperatures were below freezing for most of the day…but the snow melted almost as fast as it fell. Precipitation from the melted snow totaled 0.70 inches. This would be around 7.0 inches of estimated snowfall. In 1912…a severe wind and dust storm struck the city. West winds were sustained to 40 mph with gusts to 42 mph. In 1967…a late season snow storm affected areas along the eastern foothills from Denver south. Snowfall between 2 and 3 feet closed I-25 between Denver and Colorado springs. In Denver…snowfall was only 3.6 inches…but precipitation from the storm totaled 3.25 inches…the greatest 24-hour precipitation ever recorded during the month of April. North winds gusted to 35 mph at Stapleton International Airport. Temperatures across the city were in the 30’s most of the day. In 1974…a major spring snow storm dumped 8.5 inches of heavy wet snow at Stapleton International Airport where north wind gusts to 38 mph produced some blowing snow. The storm caused minor damage to public utilities. In 1986…strong winds howled across metro Denver. Boulder reported a peak gust of 79 mph. Wind gusts of 55 to 60 mph were common across all of metro Denver. There were power outages. The wind toppled a brick wall under construction in Arvada…and also damaged luxury sky boxes under construction atop mile high stadium in Denver. Road signs in Arvada were damaged. West winds gusted to 56 mph at Stapleton International Airport. In 2014…a storm system brought heavy snow to areas in and near the Front Range Foothills. Storm totals included: 13 inches near Conifer; 12.5 inches near Ward; 11.5 inches near Nederland; 10 inches near Allenspark…Golden and Gold Hill; with 8.5 inches at Roxborough State Park. In 1968…high winds struck Boulder. Sustained winds of 50 mph with gusts as high as 102 mph were recorded at the National Center for Atmospheric Research…while in downtown Boulder winds peaked to 73 mph. The winds damaged a building under construction and some homes in south Boulder. Northwest winds gusted to 35 mph at Stapleton International Airport on the 13th. In 1996…a potent spring storm strengthened just east of Denver. Blizzard conditions developed over eastern Adams and eastern Arapahoe counties. Strong northerly winds ranging from 25 to 50 mph…cold temperatures…and heavy snowfall combined to create very hazardous conditions. The strong winds whipped snow in drifts 3 to 4 feet high. High winds and heavy wet snow downed power lines and caused traffic accidents. Some roads were closed. Snowfall totaled 15 inches at Strasburg…while only 2.1 inches of snow fell at the site of the former Stapleton International Airport. North winds gusted to 40 mph at Denver International Airport on the 13th. In 2011…a potent spring snowstorm brought heavy snow to Front Range mountains and foothills. Storm totals included: 16.5 inches near Blackhawk; 16 inches at Nederland; 15.5 inches at Coal Creek Canyon and 5 miles northeast of Ward; 15 inches at Allenspark; 12.5 inches… 5 miles northwest of Idaho Springs; 12 inches at Echo Mountain Ski Area; and 10.5 inches near Georgetown. In 1945…heavy snowfall totaled 9.8 inches in downtown Denver. Most of the snow…4.8 inches…fell on the 14th. Snow fell for a total of 53 consecutive hours. This was the second big snow in less than 2 weeks. The air mass was very cold for April. High temperatures of 21 degrees on the 14th and 32 degrees on the 15th were record low maximums for the those dates. In 2001…a huge dust storm over southern and Inner Mongolia during April 3rd through the 6th lifted desert dust into the jet stream. This dust cloud moved over metro Denver on the 13th and persisted through the 17th. The cloud created widespread haze…giving the sky a milkish cast due to the scattering of incoming solar radiation. In 1872…high winds damaged buildings in the city. At 9:00 am west winds commenced to blow a perfect gale… Averaging 40 mph sustained until 9:00 pm. In 1904…west winds sustained to 40 mph with gusts to 48 mph warmed the temperature to a high of 74 degrees. In 1918…a thunderstorm produced hail that covered the ground to a depth of 1/2 inch. The stones varied in size from small shot to a cherry stone. Rain and melted hail totaled 0.70 inch. There was no reported damage. In 1935…northeast winds sustained to 30 mph caused a dust storm across the city. The visibility was greatly reduced by blowing dense dust. In 1970…strong winds caused mostly light but widespread damage to trees…roofs…power lines…and other property across the northeastern Colorado plains. Wind gusts of 45 to 60 mph were common. Southwest wind gusts to 44 mph occurred at Stapleton International Airport. In 1995…high winds spread from the foothills onto the plains. West winds gusted between 70 and 90 mph in the foothills and 50 to 70 mph on the plains. West winds were clocked to 51 mph at Denver International Airport. Most of the significant wind damage occurred north and east of metro Denver. In 1873…north winds blew a gale during the afternoon on both days. Winds were brisk throughout each day. In 1902…snowfall totaled 6.0 inches in downtown Denver. Most of the snow melted as it fell. Northeast winds were sustained to 20 mph. In 1910…strong winds occurred on both days. Northeast winds were sustained to 52 mph on the 14th. North winds were sustained to 44 mph on the 15th. In 1921…heavy snowfall and strong winds produced near- blizzard conditions in the city. Snowfall totaled 10.0 inches. Strong north winds sustained to 48 mph with gusts to 54 mph on the 15th produced drifts to several feet in depth. The heavy wet snow caused extensive damage to trees…utility poles…and buildings. Precipitation from the storm was 1.73 inches. Very heavy snow also fell in the foothills. At silver lake…in the mountains west of Boulder…95 inches of snow fell in 32.5 hours on the 14th and 15th. In 1935…dense dust…apparently behind a dry cold front… Enveloped the city at 1:00 pm on the 14th and persisted through the night. The dust blew into the city on northeast winds sustained to 30 mph with gusts to 32 mph. By mid-morning on the 15th…the dust had become light and continued as such into the evening. North winds were sustained to only 13 mph on the 15th. In 1999…a spring storm dumped heavy snow over portions of metro Denver. Nearly 2 feet of snow fell in the foothills with half a foot to a foot over western and southern suburbs. The heavy snow alleviated drought conditions and associated high fire danger that prevailed during much of the winter season. Snowfall totals included: 22 inches in Coal Creek Canyon…20 inches at Wondervu…19 inches at Genesee…17 inches near Evergreen and Nederland and at Idaho Springs and Tiny Town…14 inches at Georgetown…13 inches at Morrison…10 inches near Sedalia…9 inches in south Boulder… 8 inches at Highlands Ranch and Wheat Ridge…and 7 inches at Littleton and Parker. Only 3.4 inches of snow fell at the site of the former Stapleton International Airport. North- northwest winds gusted to 41 mph on the 15th at Denver International Airport. This entry was posted on Sunday, April 8th, 2018 at 5:33am MDT and is filed under Weather History. You can follow any responses to this entry through the RSS 2.0 feed. You can skip to the end and leave a response. Pinging is currently not allowed.